A recent study out of the University of Nebraska, the Harvard School of Public Health and Beth Israel Deaconess Medical Center shows that pot smokers, on average, have smaller waists and higher levels of "good cholesterol" than non pot smokers even though they tend to eat more. Finally, a diet plan that's fun and effective! Researchers don't know what it is about marijuana that makes it such a useful regulator of blood sugar or how it manages to speed up you metabolism, but the proof is in the six pudding cups that you just watched your stoner cousin Tim down in one sitting. So how can one of these slim, THC-laden bodies be yours? As someone who doesn't really smoke, I'm not sure myself, which is why I — like Dian Fossey going to live with the gorillas — reached out to some of my closest, highest friends (i.e. the ones who are currently on Gchat) for a little advice on how to follow the Stoner's Diet Plan. Follow the steps below and then add weed. 1. You can never be too prepared. I'm lucky to be desk mates with Tracie Egan Morrissey whose book "Pot Psychology: How to Be" (which she cowrote with fellow Gawker writer Rich Juzwiak) is the perfect manual for stoners. When I asked her for diet advice, she just handed me a copy and directed me to page 217 — "How to Be a Pothead Without Gaining Weight." The key to not eating like a dog with opposable thumbs is to prepare your snacks in advance of getting high. If you buy a crate of blueberries, you will eat that crate, but at least you won't be eating a crate of donuts. Or dipping Milano cookies in peanut butter. Or toasting taco shells, breaking them up, and making nachos out of them. Or eating ramen noodles raw. Or making s'mores and substituting Cool Whip for marshmallows. Or eating a whole bag of marshmallows in one mouthful. That's dangerous and best reserved for kids on YouTube. Only idiots would put their marijuana fueled exploits online. When I bothered Rich for more information on how a non-smoker can eat like stoner, he was nice enough not to say "Outta my face, square!" and give me a real answer. "I recommend buying healthy and throwing out anything unhealthy BEFORE you smoke," he tells me, then adding this caveat: "But that often means that you just end up making a trip to the store when you are super high, which can be fun and scary and thus exhilarating." Friends outside of Gawker Media also recommend preparing ahead of time. One food of choice to have on hand (brought up by multiple sources) was popcorn. "I make a big bowl of popcorn because it's pretty healthy and there is a lot of it for the methodical and repetition action that is so pleasing to my high brain," says Weedina Weedinstein,* a graphic designer and science enthusiast who lives in Brooklyn. "Then I add something sweet like one cookie or piece of chocolate." 2. Utilize the extra daylight and warmer weather of summer and be active. Another friend who we'll call Dopestia Grassley because, in addition to being a stoner, she has a nice gig in PR that she'd rather not lose (also, she's the dopest), told me that day smoking and being outside is one way that she controls her food intake. "I think getting the munchies is very dependent where you smoke and when," she tells me. "Summer is awesome because I can be active and high. I like to do specific things stoned like going to museums, movies or being in nature. Day smoking is better in that respect." "Plus you can wear sunglasses," she adds. Good advice whether you're high or not! Thanks, Dopestia! It's hard to inconspicuously sneak a bong rip or light up a joint in most public places, so get a vaporizer. They're discreet and mostly odorless, which will help be out in public and away from the easy access of your own kitchen cupboards. 4. Or just have a baby. Tracie says, "A really good way to keep trim as a pot head is to have a baby so that you always have to smoke pot away from home, and away from your pantry and fridge." Please revisit suggestion 3 before you commit to this. It's a last resort. 5. Smoke, then fall immediately asleep. 6. Utilize your social anxiety. This one comes directly from yours truly! I've found that smoking in large groups always leaves me feeling petrified that I might commit a faux pas. It's horrible and the main reason why I don't do it very often. The good news? Terror and anxiety tend to eradicate hunger by twisting your stomach into knots. The bad? EVERYONE IS THINKING ABOUT WHAT A PHONY YOU ARE. 8. Forget all of the other advice and eat what you want. Weren't you listening at the beginning of all of this? 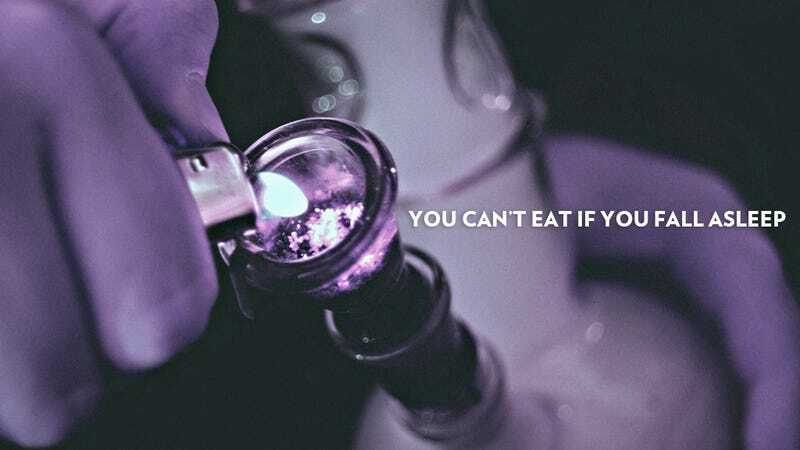 Stoners eat more than anyone (up to 600 calories a day more, says the University of Nebraska/Harvard School of Public Health/Beth Israel Deaconess Medical Center study) and they're still trimmer than the rest of us. Dopestia — who was maybe high when she said this — told me, "I do think that the way most Americans think about food is wrong — that food is the enemy and fat, gluten and carbs are the devils. Maybe stoners just know what's up. It is the YOLO diet." She does advise, however to stay away from state fairs while stoned because they're full of delicious smelling junk food and you might end up riding "down a huge slide on a potato sack" like she did. Rich also had some very good advice on what to think about when choosing snacks to eat while stoned. You really start to think about what you're eating and how a lot of crustaceans are just bugs of the sea. Also the slipperiness of clams and oysters is a total freakout. And because you can never be sure that you won't get sick, pot's paranoia will make you think you're going to get sick. In this way, I think eating vegetarian is always the way to go when you are high because at the worst what you'll get is something that is bland. It's unlikely that vegetarian dish will spoil your stomach or give you a piece of gristle to chew on and then send your mind to bemoaning the factory farming industry. Now go enjoy your new diet.